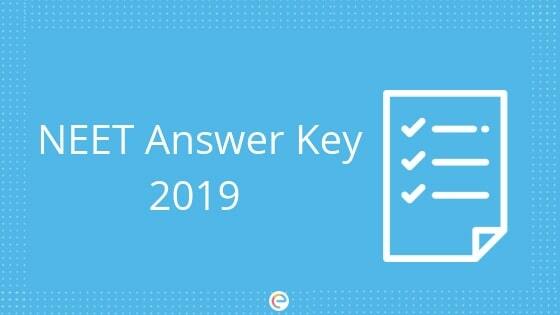 NEET Answer Key 2019: The official NEET Answer Key 2019 will be released by NTA a few days after the exam is conducted. Candidates can then check the NEET Answer Key and predict their score. This will give them an idea about the college they will get into with their NEET score. Additionally, students can also find out if they are likely to get any bonus marks. The NEET 2019 Official Answer Key will tentatively be made available for students to view on 25th May 2019 on the official website of NEET. Candidates who couldn’t check the official NEET Answer Key during the stipulated time will have to wait for NEET 2019 result which will be declared by NTA on June 5, 2019. Experts at Embibe will provide NEET Answer Key along with detailed solutions of NEET 2019 right after the exam. Remember to watch this space (bookmark this page for your convenience) so you can download NEET Answer Key by Embibe along with NEET question paper and solutions for all sets. Calculate your NEET score and get to know your rank within a few hours after writing the exam! Additionally, you will also get answer keys released by other coaching institutes for comparison with Embibe’s NEET Answer Key. You can also get NEET Answer Key as released by other coaching institutes and compare them. NTA will release official NEET Answer Key by the third week of May. OMR answer sheets and responses of students will also be released. Candidates can then check their responses and the official NEET Answer Key and predict their score. Step 1 Go to NEET official website. Step 2 Click on the link provided to download the NEET Official Answer Key. Step 3 Enter your Registration Number and Password to login. Step 4 Download the official NEET Answer Key. As mentioned earlier, before the NEET result is declared, candidates will be able to challenge the NEET Official Answer Key. NTA will then rectify if there are any mistakes in the NEET paper and the revised NEET Answer Key will be released. Click on the link provided for Key Challenge. Click on “Answer Key Challenge” and then select the paper code. Select the question you want to challenge. Make payment of fees using Debit Card / Credit Card / Net banking. Take a print out of the confirmation slip. The revised NEET Official Answer Key will be released in the fourth week of May. The NEET result will be declared on June 5, 2019. Candidates will have to log in with their Registration ID and Password in order to view and download their NEET result. It is to be noted that NEET result will be available only in the online mode. No hard copy of the result will be sent to the students. We hope this detailed article on NEET Answer Key helps you. If you have any query regarding the NEET Answer Key, drop it in the comment section below. We will get back to you.